As many of us already know, studying English is not only practicing speaking and vocabulary. In fact, one of the best ways to practice your new language skills is to pick up a book and Read. Many of our Cambridge students have taken advantage of their time here by reading specific books that may appear in some form on their upcoming exam. For my CAE class, the students have been reading The Lighthouse, by P.D. James. Set on a ficticious island just off the coast of England, the book follows a detective, Adam Dalgliesh, as he investigates the possible murder (or was it suicide?) of an island visitor. 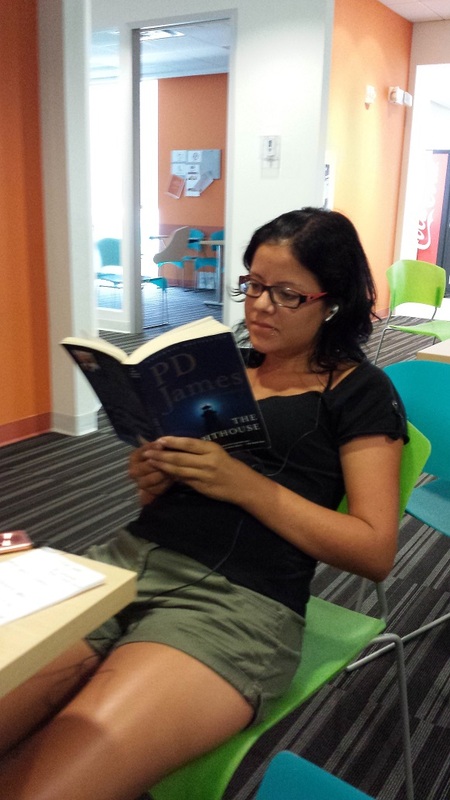 Here, we see Jeannette (from Switzerland) in our student lounge catching up on Dalgliesh’s adventure. Good luck to all of our students as they start their Cambridge exams next week!